So, I was going through some of the bed and breakfast reviews on various websites the other day trying to see if there was something we might be missing in the way of customer service or advertising or if other Bed and Breakfasts might be doing things differently that would make sense for us. I came across a review where the guest compared the one seating breakfast to a “cattle call”. Here at The Secret we do a one seating breakfast. When we took over here, that was the way the prior owners had done it for 16 years. 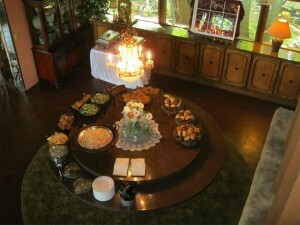 The bed and breakfasts we had looked at purchasing prior also did a one seating breakfast. As a matter of fact, what sets a bed and breakfast apart from just an ordinary hotel stay is coming together around the breakfast table and meeting new people. Visiting with our guests at breakfast is one of the most favorite parts of my job! Many of our friends today we met at the breakfast table and many who return again and again come because of those they have met in the same way. So, what is the consensus? One seating breakfast, yay or nay?